Michael Copeland has been selected as one of the Top Rated Real Estate Agents in Seattle to be featured on TV Top Real Estate on Xfinity On Demand available on Comcast. TV Top Rated Real Estate features videos of Top Rated Real Estate Agents and their homes listed for sale which will allow consumers to select the best Real Estate Agent when buying or selling their home. As a top rated agent, Michael Copeland is able to offer his clients the opportunity to showcase their homes for sale on television 24-hours-a-day, 7-days-a-week. Michael Copeland has also been honored on top real estate shows as an award-winning Real Estate Agent. 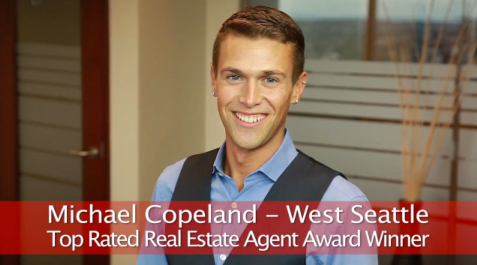 Top rated Real Estate Agents like Michael Copeland were hand selected and interviewed by an independent research team who determined them to be the top 5% in the region. Real Estate Agents were selected because of popular reviews by customers on review websites such as Yelp, Trulia, Zillow, Redfin, Realtor.com and other leading independent real estate rating companies. Michael Copeland is a true professional with a passion for helping people. Michael is a diligent, detail-oriented and trustworthy realtor with exceptional communication skills. What distinguishes Michael from other realtors is his responsiveness, amazing follow-up/follow-thorough, and knowledge of the market. Michael works with both buyers and sellers in the Seattle Metropolitan area. His specialties include working with first time home buyers, relocating clients, luxury properties and new construction. Whether you reach your real estate goals or not will depend on you choosing the right agent. Michael is committed to ensuring your goals are met and will take the time to listen to you and understand your real estate needs.